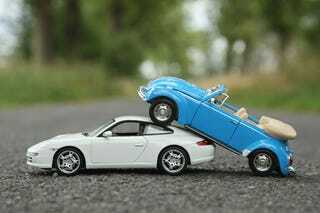 Like a snake trying to eat its own tail, Porsche and Volkswagen AG (and their respective families) are jockeying over ownership of two companies that are practically one — though VW now has a slight advantage. Porsche had been on a roll and, using their advantage, attempted a VW takeover but then almost went bankrupt trying and had to be saved by a VW loan. Porsche is still in the hole to the tune of ten-billion Euros, so a VW deal would help overcome this. On the other hand, it's unclear what Ferdinand Piech, who both co-owns Porsche and serves as chairman of Volkswagen, wants to do.